If you're nervous about moving with children, you're not alone. Moving is nerve-wracking for even the calmest adults, and moving with children adds additional tension, as you wonder how they'll adjust to their new schools, new friends, and new life. Fortunately, there are several ways to make the process easier. Don't wait until the last minute to tell them about the move. Although you may be afraid giving your child advance notice will allow him or her more time to complain about the move, in the end, providing them with fair warning will allow them to make peace with it (the move) and tie up any loose ends. It'll also provide you ample opportunity to address your child's fears and discuss specifics before you become too busy with other details surrounding the process. Explain why you're moving. From a very young age, children are acutely aware of what goes on around them. If you're moving for work-related reasons, your child will understand (even if he/she isn't happy about it). Likewise, if you're moving to be closer to aging parents or pursue a more comfortable climate. Whatever the reason, explaining it in kid-speak will help your child understand moving is in his/her best interests. Teach your children about your destination. No matter where you're moving, you can find interesting things to do and know about, in your new city. Take time to research the place with your child so that he or she can get excited about the opportunities that lie ahead. You can even check out Billy's location-specific moving guide for helpful information about some of the most popular moving destinations. 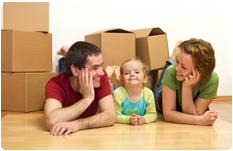 Let your children participate in the moving process. Your children will feel more comfortable with the move if they are able to contribute to the effort and have a say in their future. Explain that even though they're moving, they don't need to bring all their things, and that they can pick and choose what stays and what goes. Allow your children to pick their bed's position in their new room(s) or to choose a new wall hanging or bedspread, to create a new space for themselves. Plan an advance trip to your new city. If you have enough notice before your move, taking your children to visit their new neighborhood can be extremely beneficial. Not only will the thrill of the travel excite them (especially, if it's by plane or train), but they'll be able to see firsthand some of the cool things to do, there. This is also a great opportunity to go house-hunting and to hear which houses your children prefer to live in. If possible, you can even show off your new office so that your children will better understand what you'll be doing. Moving with children is much easier if they have something to look forward to. Host a 'goodbye for now' party. Every child loves having a party, and a 'goodbye for now' party will show your child how loved he/she is, which will give them positive memories to carry forward. This type of party will also send your child the message that you do plan on coming back to visit your old town soon. Don't be afraid to discuss the past. Moving with kids is extremely difficult because they want to remember the past, but you often wish they'd focus on the future. Still, depriving them of their memories is a surefire way to slow down your integration. Compare the great things about your new town to things in your old neighborhood so that your child can see firsthand that it's going to be okay. Let your child hold his or her memories close by and explain that you want to help them have great, new experiences in their great, new city.